Henri Cartier-Bresson was on the scent of something when, in 1977, he appointed a young Indian photojournalist to Magnum, the legendary photo agency that the Frenchman co-founded. 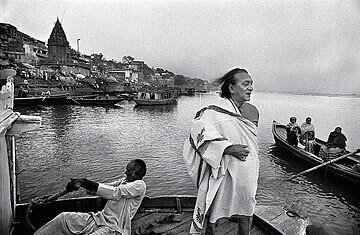 Perhaps Bresson noticed in his protégé, Raghu Rai, the very qualities that characterized his own work: clarity of composition, an ability to perceive the true nature of any human face, and the sudden, unconsidered thrill of a moment caught on the run. After four decades of eye to aperture, Rai has fulfilled the faith vested in him. Rai first sprang to international attention with his photographs of the Bhopal gas tragedy. His image of a child's corpse, eyes scorched out of recognition in a pyre of ash, is galvanic and unforgettable. His best-known books, the sweeping Raghu Rai's India: Reflections in Colour and Reflections in Black and White, contain many other indelible images, yet they are also scattered at times. Rai is far better when he concentrates on the specific and the singular  and that is why the publication of his most recent work, The Indians: Portraits from My Album, is such an untrammeled joy. The first half of this luscious title bears images of the colonial era, by Indian masters such as Raja Deen Dayal as well as key British studio photographers like Bourne & Shepherd. Many of these photographs of royalty and tribespeople, Gujarati clans and pilgrims, were framed for occidental audiences. The Indian subjects often are seen as exotics, staring from the page like bejeweled prey. They are here not only to show the origins of photographic portraiture in India, but also presumably to serve as a counterpoint to Rai's far more intimate images. The latter half of The Indians is entirely his coruscating province. In Rai's photographs of the politician and sometime fashion icon Maharani Gayatri Devi, one glimpses a cunning refinement and slippery charm. Mother Teresa's images possess an almost sculptural quality, deftly revealing of a life exhausted for others. In portraits of musicians like Ustad Bismillah Khan or the Pakistani poet Faiz Ahmed Faiz, a Rilkean mood looms, making them seem part mystics, part madmen. Refugees from Bangladesh, with wide eyes of dread, immediately summon to mind Dorothea Lange and Roy Stryker, who both powerfully recorded the American Depression. The great filmmaker Satyajit Ray, posing with a pipe, looks positively kooky, while the Dalai Lama is withdrawn in pelagic depths of contemplation. Rai's strongest portraits, however, are of an anonymous group of laborers who "came to paint and polish my house." The images document the human face with compassion and precision, revealing a tremor of beauty in each. Rai's mentor, Cartier-Bresson, came from painting to photography. In these portraits of the toiling Indian everyman, the protégé has attained such a commanding photographic aptitude that only one adjective works as praise: painterly. See TIME's best photos of 2010.